So, I normally don't really do this kind of thing, as I'm not super good at answering random questions. 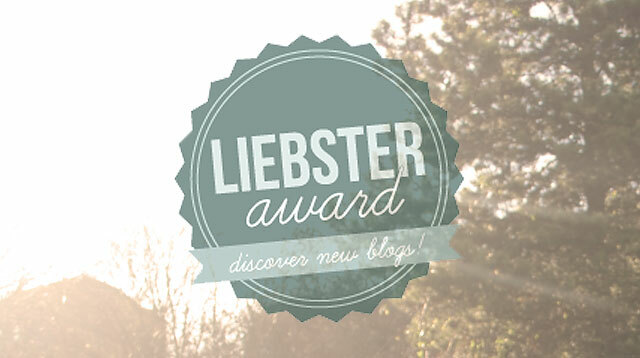 However, over at Little Bits Of Lovely, I was nominated for the Liebster Award (thank-you! ), and I decided to give it my best shot. 1. What is the funniest thing that ever happened to you? I grew up with nine siblings. I've had more funny things happen than I can list. Really. I'm not joking. 2. What is your dream job and why? I have my dream job! I always wanted to be a librarian (working with books all day, duh. ), and now I have it and love it! 3. What is your favorite movie and why? This is hard. There are so many good ones to choose from. Of the top of my head, my top five would be August Rush, The Fellowship of The Ring, You've got Mail, Mostly Martha, and Ponyo. 5. Have you ever been on a real adventure? If so, what happened? Does traveling to Norway count? Because it was definitely an adventure for me! 6. Olives or mushrooms? Both! I LOVE green olives, but I'm pretty much obsessed with mushrooms. 7. What is your favorite scent? Rose. And lavender, and vanilla. But first, Rose. 8. If you could have your dream vacation where would it be, and why? To an island. That has warm, crystal clear water. And lots of shade. And fresh fruit. Yeahhhhhh. That's where I want to be. 9. Gloves or mittens? Why? Gloves, so I can use my fingers. 10. What is your favorite season and why? Always and forever Spring! I love Spring. The weather, the sounds, garden planting, flowers blooming, babies being born. 1. I can both read and write, backwards. 2. I can also do everything but write and play guitar, with both hands. So, although I'm mainly left hand dominate, I can pretty much use either one. 3. I love to cook, but hate to eat my own cooking. I love when others cook for me. 4. Pretty much the only food I don't like is tomato soup. 5. I read about three books at the same time, on average. Sometimes more. 6. I name most of my things. Like my computer, and my camera. Yeahhhh. 7. I'm super good at remembering names, but terrible with dates. 9. I hate to bake. Unless it's bread. 10. I used to never write lists. And then I turned about 26, and became a list fanatic (old age maybe?). 11. I'm pretty much obsessed with all things medieval, fantasy, and Lord of The Rings. Okay, now is the part where I'm supposed to nominate some other blogs, but I'm lazy. So, if you want to join in, count yourself nominated! 1. Book or kindle? Or both? 3. Where did you grow up? And what was your favorite thing about it? 4. If you could change you name, what would you change it to? 5. If you could visit with one person (past or present) for an hour. Who would it be? 6. What is you favorite thing about yourself? 8. What is you best memory? 9. If you could be famous for something, what would it be? Questions from you, I'll answer with gut reactions! 2. Ocean or rivers? Have played in both. And done work related to both. 3. Where did you grow up? On a big vast ranch in the wild, wild west -- not what I think, but what other people would say... And what was your favorite thing about it? Wild and west? Mostly I love and miss the vast. 4. If you could change you name, what would you change it to? My movie actress name is "Chere Andersen", and people do spontaneously have called me Cher as a term of affection -- tho' I don't necessarily like it at all. They also call me Cheerily -- which is how spell check corrects my name -- and I do like that. Oh dear me! A difficult one! Right now that would be you! 7.What is favorite color? Blue? I've won a lot of ribbons this color in 4-H and sports and who knows what else! And my closet, tho' second hand, seems to be full of this color too. Or red? Tho' that means settling for second place and I once attended an evening lecture that said my choice of wearing this color meant I had other things on my mind. AHEM!!! No more evening lectures for me. 8. What is you best memory? With my best friend, swinging our legs and singing out the second story of our barn at the top of our lungs with many miles between us and anyone that could hear! I have many other favorite memories, but that is the first one that came to my fingers as I was typing. 9. If you could be famous for something, what would it be? I'd rather not be famous. Thank you, that was fun. Hope you are having a good week! Yes, we've talked a bit about CT. Where you grew up is about an hour from me, I'm more central CT. ;) Yeah...very rarely does my name get pronounced correctly the first time, and hardly ANYONE spells is correctly. My friends only know how to after writing it for years!